A self-contained air conditioner has all of the major components mounted on a single chassis, which is installed in the living area; usually under a bunk or settee, or in a locker. 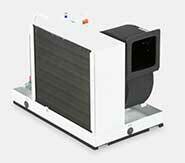 Cooling-only models are available, as well as reverse-cycle, which can cool or heat. Also available are air conditioning kits, which include the self-contained unit, water pump, ducting, and grilles -- all the components needed for a complete system. 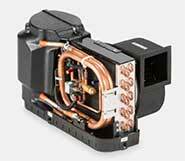 Contact our Parts Department for all your marine air conditioning parts and equipment needs. We are here to answer your questions and deliver your parts and equipment quickly and efficiently. Tropical Marine Air Conditioning, Inc. services and sells marine equipment and Marine Air Parts- Marine Air, AquaAir, Technicold, and Cruisair air conditioning, refrigeration by U-Line, Spot Zero and Sea Xchange, ECOmar Sewage Treatment Systems, and Eskimo Ice ice machines.